Four decades of operations in the Marine World cannot be a coincidence! Being the strongest marine ticket network in Asia and Europe, we manage to maintain the excellent service throughout these years based on the best Human Platform: our people! We know that business never stops, so our people are there, providing the most personal P2P contact. They feel, hear and operate every day and every night offering the right service, the right time, any time. We are proud to support a fleet with more than 234 Bulk Carriers, 84 Container Carriers, 175 Product Tankers, 212 Drilling Boats and 34 Cruise Ships. Your great support all these years empowers us to continue and even expand in the great Shipping World of Hong Kong, Shanghai, Singapore,London, Manila, Athens, Beijing, Dalian, which are some of the places you can meet us! But you can always find us, closer than you think, because… We keep the world moving around! 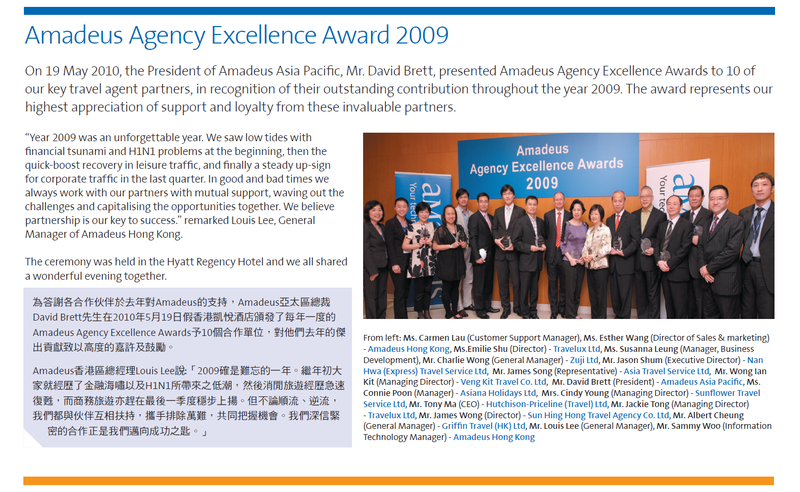 Asia Pacific Biggest Producer in Amadeus GDS for years! Asianas` second name! Close to Marine Global Industry for more than three decades, enhanced experienced stuff to deliver the right When, What and How for your request. We respect your budget and we feel responsible to offer you the best available fare ,choosing besides the three different World Area Airfares, among our different country offices. We are a marine and corporate travel and we acknowledge that your business never stop working, why should ours? For us a 24/7 service is obvious and offered to ALL clients! Using our Multi currency programs we achieve to deliver you a fare in a single currency of your preference, no matter the issuing country or local currency. Issuing for 240 Airlines and more! Global airlines network offered to you as your local. Our extended Global Airlines Agreements among our offices around the world, assured that your schedule will always be priced! We have the most extended fare network intraAsia in the marine market for the last decades offering Chinese and Asian Airlines where nowhere else you could purchase. We are proud to hold the recognition prize of the biggest producer of Air Segments in Amadeus Global Distribution System for the area of Asia Pacific! We know about your corporate mile agreements with the airlines. We know about the individual mile cards you may have. We give you “miles” on the top of all the above. How? Contact your local Asiana Executive Officer. 2/f 9,Filellinon & Akti Miaouli Str.